Global Warming is without doubt one of the hottest subjects in the news at the moment (if you'll pardon the pun), and opinions vary on what is causing this phenomenon. The most popular theory is that WE are creating the problem with CO2 gases, others believe it is a climatic trend (something that happens to the planet from time to time), and some think it might have something to do with the Sun. There are of course a number of people who don't think there is a problem at all! 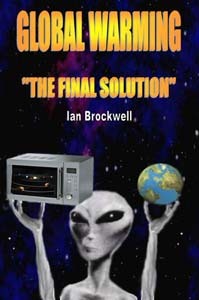 A book (released 3rd March 2007) called "Global Warming - The Final Solution", written by Ian Brockwell, provides some interesting theories on the subject of Global Warming, the following is a press release from the author. Global Warming - A 250 million year replay? There is no shortage of theories on the internet regarding the cause of Global Warming and whilst none of these may be guilty of directly creating the warming effect on their own, it may be true to say that they all play a part. It is perhaps human nature for people to assume that a complicated problem requires a complicated solution, when quite often the answer is there for all to see. Many people are no doubt aware that 250 million years ago our planet was much warmer than it is now, and sea levels considerably higher. This information alone may be of little interest, as our planet has experienced many hot and cold periods in its history. However, this may appear more significant when you remember that it takes the same period of time for our solar system to pass around the galaxy. It is a known fact that Cosmic Rays (microwaves) are more concentrated in some areas of the universe than others. Is the solar system entering a more "active" area of our galaxy at the moment, and did exactly the same thing happen 250 million years ago? Let's take a look at the "evidence". Earth is not the only planet in our system being affected by increasing temperatures, we are seeing this phenomenon on all the planets. Some are beginning to suggest that the Sun might be responsible for this, and at first glance that seems a reasonable assumption, except for one thing. In July 2002, observers discovered that Pluto's thin atmosphere had cooled over the previous 14 years, but the surface was getting warmer. This distant planet appeared to be affected in much the same way as the others, yet was moving further away from the Sun. Surely, the warming should have been less noticeable on this planet, if the Sun was to blame? The speed of the Global Warming effect also indicates "outside forces" at work, and this continues to accelerate at a frightening rate (most noticeable in the last 20-30 years). Historic records show no evidence of such rapid temperature increases on our planet before, except perhaps following a large Asteroid impact or some other natural disaster. But what other factors might support the theory of cosmic rays causing Global Warming? It's impossible to believe that I might be just one of a handful of people who have considered this, and the subject of "Chemtrails" seems to suggest I am not. Chemtrails became more visible shortly after the warming was discovered on all the other planets in our system. I suggested earlier that the cosmic rays were "microwaves", and we all know what happens to something placed in a microwave oven. We also know what to expect if we place something metallic in the oven as well (like aluminium foil for example), there are sparks and crackling noises as the microwaves are deflected by the metal. Is it a coincidence that the compounds found in Chemtrails are metallic in nature (mainly aluminium)? Some have suggested that Chemtrails are an attempt to control the weather for military purposes (a US weather weapon), that they are designed for some communication purpose, or even to reduce the population. Could this be another case of looking for a complicated answer again? Am I right in thinking Chemtrails have been seen in other countries? If this is so, maybe we can exclude the "US military" options from the equation. Perhaps governments know exactly what is happening and what to expect, and Chemtrails are nothing more than an experiment to shield our planet from cosmic rays. Naturally, this would be kept a secret, how would people react if they knew the planet might be 20° Celsius warmer in the next 25 years or so, and sea levels 300 feet higher! I recently wrote a book (Global Warming - The Final Solution) attempting to explain how things might be, in the hope that this might prepare people for what I believe is inevitable. It was written as a novel because I feel such messages are accepted more easily in this form. The ending may appear very "Sci-Fi", but this too is not as fantastic as it seems (but I will let you be the judge of that). The purpose of the book is to encourage people to look at the Global Warming problem in a different way. It may be too late, or impossible to change the future, and perhaps it is time to start thinking more about how we could survive in a New World, just in case? Author of "Global Warming - The Final Solution"
* Hundreds of millions of Africans and tens of millions of Latin Americans who now have water will be short of it in less than 20 years. By 2050, more than 1 billion people in Asia could face water shortages. By 2080, water shortages could threaten 1.1 billion to 3.2 billion people, depending on the level of greenhouse gases that cars and industry spew into the air. * Death rates for the world's poor from global warming-related illnesses, such as malnutrition and diarrhea, will rise by 2030. Malaria and dengue fever, as well as illnesses from eating contaminated shellfish, are likely to grow. * Europe's small glaciers will disappear with many of the continent's large glaciers shrinking dramatically by 2050. And half of Europe's plant species could be vulnerable, endangered or extinct by 2100. * By 2080, between 200 million and 600 million people could be hungry because of global warming's effects. * About 100 million people each year could be flooded by 2080 by rising seas. * Smog in U.S. cities will worsen and "ozone-related deaths from climate (will) increase by approximately 4.5 percent for the mid-2050s, compared with 1990s levels," turning a small health risk into a substantial one. * Polar bears in the wild and other animals will be pushed to extinction. * At first, more food will be grown. For example, soybean and rice yields in Latin America will increase starting in a couple of years. Areas outside the tropics, especially the northern latitudes, will see longer growing seasons and healthier forests. But what if the Global Warming problem affects us much more quickly and sea levels increase by as much as 21 feet by the year 2027? The book "Global Warming - The Final Solution" takes you through the next 20 years of Climate Change, and whilst the characters in the book may not be real, the story could become a frightening look at how life will be. The author has written numerous articles "predicting" a potential global catastrophe (as a result of climate change) for some time, and did so when leading scientists were still saying that we had nothing to worry about for another few hundred years. Sadly, there seems to be no "earthly" solution to the problem, at least not one that will come in time, and we must hope that the "Final Solution" in the book might also be a reality, at least for some of us.